A demanding stranger comes to call. Send him on his way. But wait – is there more to him and his visit than meets the eye? 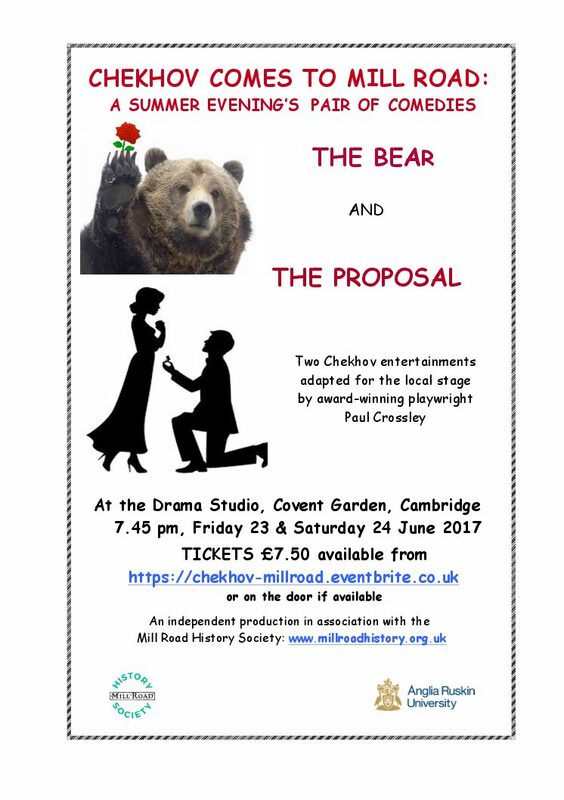 So begins a Chekhov play which has been adapted for the Cambridge stage by award-winning local playwright Paul Crossley. This, together with his version of another Chekhov comedy, will form a double bill of plays re-imagined for the city – and, specifically, the area around Mill Road. In The Proposal and The Bear theatregoers can expect references to neighbourhood shops, cafes, pubs and even some residents, during an evening devoted to celebrating Mill Road’s richness and diversity, proceeds from which will benefit the Mill Road History Society. Well-known local actors Les Wheeler, Emily Redfarn and Gareth Atkinson will double up, performing the three main characters in each of the plays. American director Michael Howley will be coming over from the United States to direct the plays. “We anticipate a unique occasion for performers and audiences alike”, says dramatist Paul Crossley. “If the young Chekhov had ever visited Cambridge he would certainly have experienced the heady atmosphere of Mill Road. I have ensured that the plays have retained their characters and essential plot but I have freely adapted them to reflect this vibrant part of the city”. Paul adds “We have a superb cast on board, and a talented director who knows the Cambridge scene well. Mill Road History Society and Anglia Ruskin (which runs The Drama Studio) have been wonderfully supportive. And we will have The Six Bells pub for refreshments – before, at the interval, and after the performance! All we need now is an audience to share the fun.” Lucy Walker from the Mill Road History Society says “We are really pleased to support local talent, and I know that this is going to be an entertaining evening. The idea of placing the 19th century Russian world of Chekhov in Mill Road, Cambridge in 2017 is intriguing. I hope everyone will come and enjoy the plays. We thank Anglia Ruskin University for generously allowing us to use the Drama Studio in Covent Garden. It is a small, intimate space – an ideal venue for Paul’s plays”.